Wow. Angie looks great in pink. 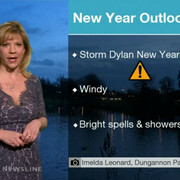 Most other news/weather ladies would have added one of those 'modesty panels' to this dress. Not Angie though, she doesn't mind showing off the twins. Probably one of the lowest cut blouses worn by a weather lady!